Filtered Water, Lean Pro® (Special Blend of Spray Dried Ultrafiltered Milk Protein Isolate, Yielding Fast Acting Whey Protein Peptides, Branched Chain Amino Acids, L-Glutamine Peptides, and Slow Acting Casein Peptides, Whey Protein Concentrate, Calcium Caseinate), Safflower Oil, Cocoa Pocessed with Alkali, FiberPlex™ (Fructooligosaccharides, Cellulose Gel, Cellulose Gum, Carageenan, Xanthan Gum), Vitamin and Mineral Blend (Potassium Phosphate, Potassium Citrate, Magnesium Phosphate, Sodium Ascorbate, Zinc Sulfate, Tocopherol Acetate, Biotin, Vitamin A Palmitate, Niacinamide, Phytonadione, Potassium Iodide, D-calcium Pantothenate, Chromium Chloride, Copper Sulfate, Cyanocobalamin, Sodium Molybdate, Sodium Selenite, Folic Acid, Cholecalciferol, Pyridoxine Hydrochloride, Riboflavin, Thiamin Mononitrate, Ferric Orthophosphate, Manganese Sulfate), Natural Flavors, Soy Lecithin, Citric Acid, Sucralose, Salt, Acesulfame Potassium. Filtered water, Lean Pro® (special blend of spray dried unfiltered milk protein isolate, yielding fast acting why protein peptides, branched chain amino acids, L-Glutamine peptides, and slow acting casein peptides, whey protein concentrate, calcium caseinate), coffee, sunflower oil, FiberPlex (fructooligosaccharides, cellulose gel, cellulose gum, xanthan gum, carageenan), soy lecithin, cocoa processed with alkali, natural flavors, vitamin and mineral blend (potassium citrate, sodium phosphate, magnesium phosphate, potassium phosphate, sodium ascorbate, zinc sulfate, tocopherol acetate, biotin, vitamin a palmitate, niacinamide, phytonadione, potassium iodide, D-Calcium pantothenate, chromium chloride, copper sulfate, vitamin B12, sodium molybdate, sodium selenite, folic acid, cholecalciferol, pyridoxine, hydrochloride, riboflavin, thiamin, mononitrate, manganese sulfate), salt, sucralose, acesulfame potassium. Shake well and serve cold. Refrigerate after opening. Contains milk, soy (lecithin). Use this product as a food supplement. Do not use for weight reduction. Filtered Water, Lean Pro® (Special Blend Of Spray Dried Untrafiltered Milk Protein Isolate, Yielding Fast Acting Whey Protein Peptides, Branched Chain Amino Acids, L-Glutamine Peptides, and Slow Acting Casein Peptides, Whey Protein Concentrate, Calcium Caseinate), High Oleic-Safflower Oil, Cocoa Processed with Alkali, Cocoa, FiberPlex™ (Fructooligosaccharides, Cellulose Gel, Cellulose Gum, Carrageenan, Xanthan Gum), Vitamin and Mineral Blend (Potassium Phosphate, Potassium Citrate, Magnesium Phosphate, Sodium Ascorbate, Zinc Sulfate, Tocopherol Acetate, Biotin, Vitamin A Palmitate, Niacinamide, Phytonadione, Potassium Iodide, D-calcium Pantothenate, Chromium Chloride, Copper Sulfate, Cyanocobalamin, Sodium Molybdate, Sodium Selenite, Folic Acid, Cholecalciferol, Pyridoxine Hydrochloride, Riboflavin, Thiamin Mononitrate, Manganese Sulfate), Natural Flavors, Soy Lecithin, Citric Acid, Sucralose, Salt, Acesulfame Potassium. Filtered Water, Lean Pro (Special Blend of Spray Dried Ultrafiltered Milk Protein Isolate, Yielding Fast Acting Whey Protein Peptides, and Slow Acting Casein Peptides, Whey Protein Concentrate, Calcium Caseinate), Sunflower Oil, FiberPlex (Fructooligosaccharides, Cellulose Gel, Cellulose Gum, Xanthan Gum, Carageenan), Natural Flavors, Soy Lecithin, Vitamin & Mineral Blend (Potassium Citrate, Sodium Phosphate, Magnesium Phosphate, Potassium Phosphate, Sodium Ascorbate, Zinc Sulfate, Tocopherol Acetate, Biotin, Vitamin A Palmitate, Niacinamide, Phytonadione, Potassium Iodide, D-calcium Pantothenate, Chromium Chloride, Copper Amino Acid, Cyanocobalamin, Sodium Molybdate, Sodium Selenite, Folic Acid, Cholecalciferol, Pyridoxine, Hydrochloride, Riboflavin, Thiamin, Mononitrate, Manganese Sulfate), Salt, Caramel Color, Sucralose, Acesulfame Potassium. Filtered Water, Lean Pro® (Special Blend Of Spray Dried Untrafiltered Milk Protein Isolate, Yielding Fast Acting Whey Protein Peptides, Branched Chain Amino Acids, L-Glutamine Peptides, and Slow Acting Casein Peptides, Cross-Flow Micro Ultrafiltered Whey Protein Concentrate), Natural and Artificial Flavors, High Oleic-Safflower Oil, FiberPlex™ (Fructooligosaccharides, Cellulose Gel, Cellulose Gum, Guar Gum, Carrageenan), Sodium Hexametaphosphate, Vitamin and Mineral Blend (Potassium Phosphate, Potassium Citrate, Magnesium Phosphate, Sodium Ascorbate, Zinc Sulfate, Tocopherol Acetate, Biotin, Vitamin A Palmitate, Niacinamide, Phytonadione, Potassium Iodide, D-calcium Pantothenate, Chromium Chloride, Copper Sulfate, Cyanocobalamin, Sodium Molybdate, Sodium Selenite, Folic Acid, Cholecalciferol, Pyridoxine Hydrochloride, Riboflavin, Thiamin Mononitrate), Sucralose, Acesulfame Potassium. Filtered Water, Milk Protein Isolate, Less than 2% of: Sunflower Oil, Whey Protein Concentrate, Inulin, Natural Flavors, Cellulose Gel, Cellulose Gum, Locust Bean Gum, Vitamin & Mineral Blend (Potassium Citrate, Sodium Phosphate, Magnesium Phosphate, Potassium Phosphate, Sodium Ascorbate, Zinc Sulfate, Tocopherol Acetate, Biotin, Vitamin A Palmitate, Niacinamide, Phytonadione, Potassium Iodide, D-Calcium Pantothenate, Chromium Chloride, Coper Sulfate, Cyanocobalamin, Sodium Molybdate, Sodium Selenite, Folic Acid, Cholecalciferol, Pyridoxine Hydrochloride, Riboflavin, Thiamin Mononitrate, Manganese Sulfate), Soy Lecithin, Salt, Caramel Color, Sucralose, Acesulfame Potassium. Filtered Water, Lean Pro® (Special Blend Of Spray Dried Untrafiltered Milk Protein Isolate, Yielding Fast Acting Whey Protein Peptides, Branched Chain Amino Acids, L-Glutamine Peptides, and Slow Acting Casein Peptides, Whey Protein Concentrate, Calcium Caseinate), High Oleic-Safflower Oil, FiberPlex™ (Fructooligosaccharides, Cellulose Gel, Cellulose Gum, Carrageenan, Xanthan Gum), Vitamin and Mineral Blend (Potassium Phosphate, Potassium Citrate, Magnesium Phosphate, Sodium Ascorbate, Zinc Sulfate, Tocopherol Acetate, Biotin, Vitamin A Palmitate, Niacinamide, Phytonadione, Potassium Iodide, D-calcium Pantothenate, Chromium Chloride, Copper Sulfate, Cyanocobalamin, Sodium Molybdate, Sodium Selenite, Folic Acid, Cholecalciferol, Pyridoxine Hydrochloride, Riboflavin, Thiamin Mononitrate, Manganese Sulfate), Natural Flavors, Soy Lecithin, Citric Acid, Sucralose, Salt, Acesulfame Potassium. The Lean Body Ready-to-Drink (RTD) Protein Shake is more than just a convenient drink – it's a nutritional powerhouse designed to help you quickly burn fat and build lean muscle. With 25 grams of high-quality protein and zero sugar per serving, Lean Body RTDs make getting that perfect physique easier than ever. If you've ever followed a carb-restricted diet, you know that great taste is often a luxury. With Lean Body RTDs, you don't have to sacrifice flavor. 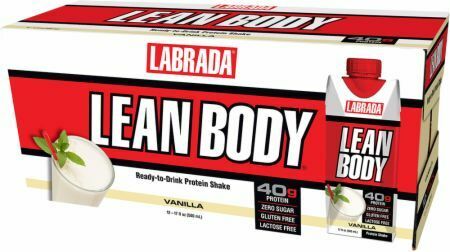 Lean Body RTDs have been awarded for their taste for a reason – because they taste like a rich, creamy milkshake! Lean Body RTD's make it easier and more enjoyable to get the protein you need – any place, any time – so you never have to go hours on end without protein. After all, as the building block of muscle, protein is the most important nutrient when it comes to strength, recovery, and growth.